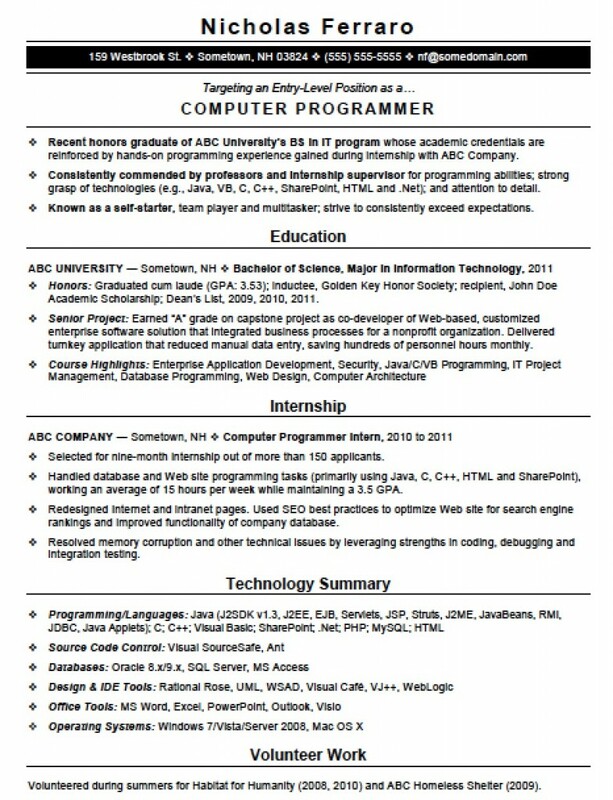 The entry-level computer programming template is a form that is to be used by an individual that has little to no experience in the professional arena. Typically, this resume is for an individual who has just completed an associate, undergraduate, or masters program and is seeking their first or initial role with a company. All experiences should be included in addition to any internships or past experiences working with various types of programming languages and scripts. Step 1 – On the top portion of the page (the ‘Header’) the name of the person should appear followed by their contact information including their Street Address, City/Town, State, Telephone, and Email Address. Step 2 – Enter your educational credentials such as college, extra curricular programs, and any masters degrees attained. Step 3 – Next provide a list of any on-hand experience you may have such as internships. Step 4 – Summarize your expertise in the field of programming such as the skills you are most comfortable or have interest. Step 5 – If there are any other credentials of experiences you feel should be stated in the resume it is to be written here such as any volunteer work completed or activities you have participated in that exemplify good character.